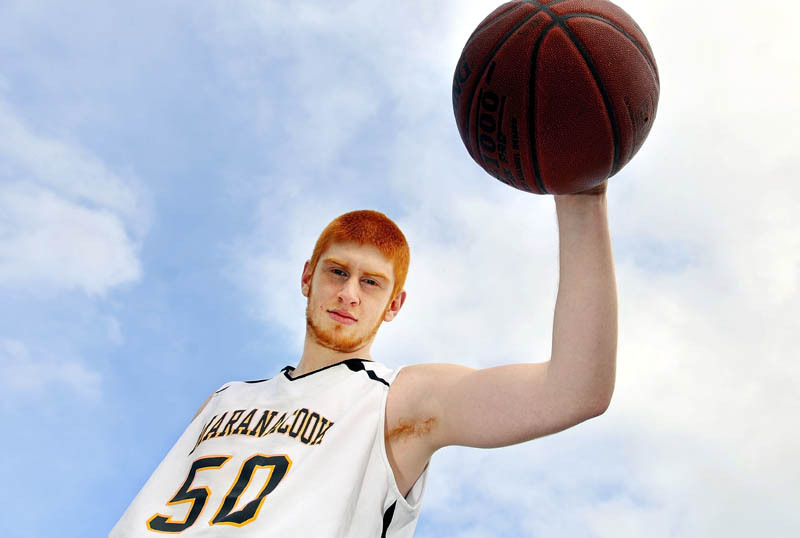 The basketball career of Maranacook Community High School senior Kyle Boucher has come a long way since his days as a gangly freshman. He’s grown both physically and mentally and this year it showed in his play. On the physical side, Boucher hit the weight room in the offseason and added muscle to his 6-foot-8 frame, making him one of the top rebounders and shot blockers in the Class B division of the Kennebec Valley Athletic Conference. On the mental side, he learned to put mistakes behind him and concentrate on the next play instead of his last one. He also was elected a team captain and took that seriously in becoming a team leader. For his efforts, Boucher has been selected as the Kennebec Journal Boys Basketball Player of the year. Gardiner’s Tyler Jamison was also considered. The Black Bears finished at 9-11, reaching the Western Maine Class B tournament after a prelim win against Yarmouth. That qualified them to play top-seeded Falmouth, a big, talented team that went on to win the Class B state championship. The Yachtsmen shut down Maranacook’s Taylor Wilbur, who scored 28 points in the prelim win, but Boucher had a strong game with 16 points, 11 rebounds and three blocks despite being surrounded by two or three players every time he touched the ball. Boucher was instrumental in leading the Black Bears to the tournament. He had a huge game in an important win against Camden Hills, with 26 points, 16 rebounds and six blocked shots. He scored 27 in a win against Belfast and in a must-win against Gardiner in the regular-season finale, Boucher scored 18 points and grabbed 17 rebounds. Gardiner was one of the smaller teams in the conference, but most of Maranacook’s opponents had at least one big post player, one reason Boucher became a serious weightlifter. Boucher was recruited by a number of Division III teams and eventually settled on Maine Maritime Academy. Maine Maritime coach Chris Murphy was persistent in his pursuit of Boucher, who isn’t ready to give up the game. Just 17, Boucher thinks he may still have a couple of inches left to grow. He’s a good outside shooter for his size, but Schmidt said he still needs work on his post moves. If this season was an indication of his progress, he will develop in that area of his game, too. “He came a very long way in his four years of high school,” Schmidt said.